Black Desert Online May 2 Game Update Patch Notes. Click <Here> to check out this week’s events in detail! Time is Gold and Brings You Treasure! Event has been added. During the event period, check the Challenge (Y) window and depending on your accumulated hours of playtime, you will receive awesome rewards! It’s Raining Enhancements Drop Event has been added. Defeat monsters of each region and have a chance to loot up to +15 gear (Main/Sub/Defense gear) as well as up to DUO accessories (earrings, rings, necklaces, belts). Enhanced gear can only be obtained by defeating monsters in the normal field and these items will not be obtainable from World/Field Bosses or Bosses summoned from Boss Scrolls. 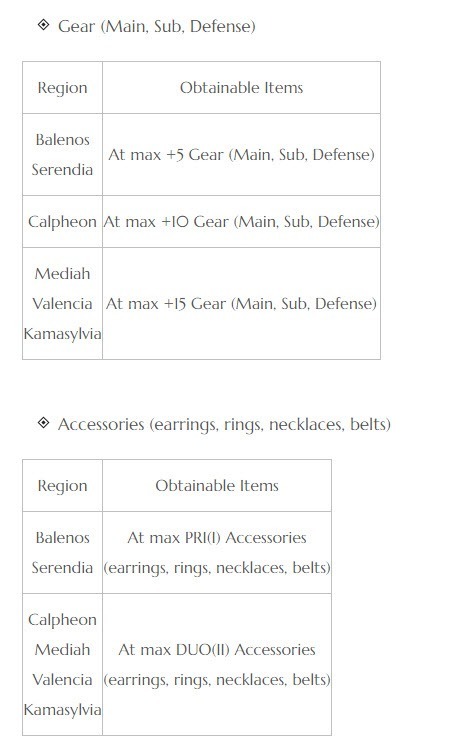 Please keep in mind enhanced accessories were obtainable before, therefore this event has increased the drop rate of the enhanced accessories. Enhanced Loot Event has been added! During the event period, defeat monsters, gather, and fish to get a boost in Enhancement material item drops! Fish to have higher chance to get Ancient Relic Crystal. New Challenge (Y) where [Event] Fairy’s Lost Item was added to celebrate the addition of Fairy Laila has ended. A new world boss Mirumok Destroyer Offin has been added. Mirumok Destroyer Offin will appear in all servers except for Olvia growth and PvP Servers. A world message will be shown notifying the appearance of Mirumok Destroyer Offin and the actual boss will come out 30 minutes after the message. After the world message of the appearance of Mirumok Destroyer Offin is displayed, it is not possible to interact with Offin using the Ancient Contract: Mirumok Watcher. World Boss Mirumok Destroyer Offin is much stronger than Guild Boss Mirumok Destroyer Offin. In the occasion that you are in the middle of a Guild raid against Guild Boss Mirumok Destroyer Offin when the world message appears, a time attack mode will start where the Guild Boss would disappear if you failed to defeat it within 15 minutes. Please keep in mind that it would be ideal that you summon the Guild Boss Mirumok Destroyer Offin much before the spawn time of World Boss Mirumok Destroyer Offin so that you do not need to deal with the 15 minute time attack. Attacking Root of Offin and the protective shield covering Offin Tett (Offin’s Force Shield) is the most effective way to engage in battle with this world boss. The attack range of Watcher Offin Tett’s motion of shooting out massive energy ball will be marked. If failed in defeating the World Boss in 15 minutes after they are spawned, a message “Offin has completely absorbed the spirit’s energy and has become stronger.” will appear, and they will go berserk mode where their attack power will increase dramatically. Note that if Offin’s Force Shield is destroyed, the energy that Offin had absorbed will be dispersed so they cannot go into berserk mode. If they are already enraged when the Shield is destroyed, they will go back to their non-berserk mode. The top 30 adventurers who contributed the most in destroying the Root of Offin will, in addition to the loots you can get for destroying Offin, get a chance to obtain Offin’s Tendril or Offin Tett’s Light Fragment. The protective shield that guards Offin Tett can only be damaged with a Hunting Matchlock. Top 30 adventurers who contributed the most in destroying the protective shield will, in addition to the loots you can get for destroying Offin, get a chance to obtain Forest Fury or Offin Tett’s Light Fragment. Once Mirumok Destroyer Offin is destroyed, Offin Tett’s Light Sealed Weapon Box, Valtarra Eclipsed Belt, Forest Fury, or JIN/BON/WON Magic Crystal – Cobelinus may drop at a certain rate. The height of Wooden Fence and Medium Siege Tower has been increased and is now about 30% higher. Blizzard, Meteor Shower, Thunder Storm, Bolide of Destruction, Wolf’s Frenzy, Sea Burial. You may still be damaged by Flame Towers. Fixed the issue where the alert message has Nouver’s background even when Ancient Kutum was disappearing due to time out. Fixed the issue where the reset system message for Imperial Delivery was not being displayed. Freezing will now take into consideration the count system of CC skills. As with Stun, Knockback, and Knockdown, Freezing will have a count of 1. Stun, Knockback, Knockdown, Floating, Bound, Grapple, Freezing: 1 (Count limit). Immune for 5 sec. 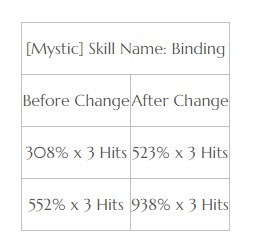 if CC skill is applied twice. Damage increase rate of Air Attack has been decreased. Though it was difficult for Air Attack to be activated before, this has been made easier due to the changes in the CC skill effect applications. 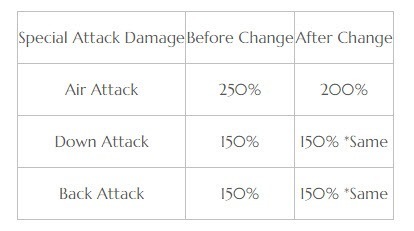 As a result, Air Attack damage increase rate has been adjusted but the changes are not great due to the fact that there still are requirements for Air Attack to be activated. During PvP, an additional 30% will be decreased from the damage rate stated above. This is same as before. 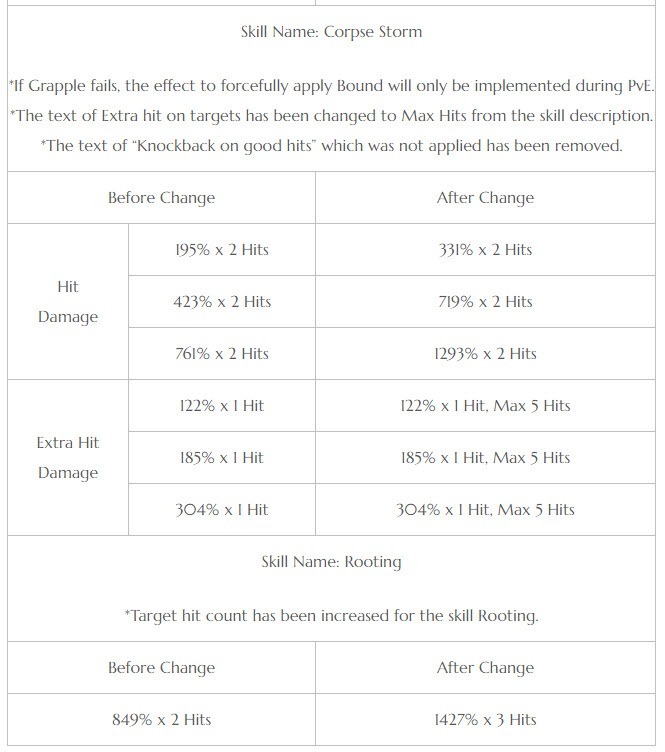 Damage inflicted from the following Grapple skills has been increased. 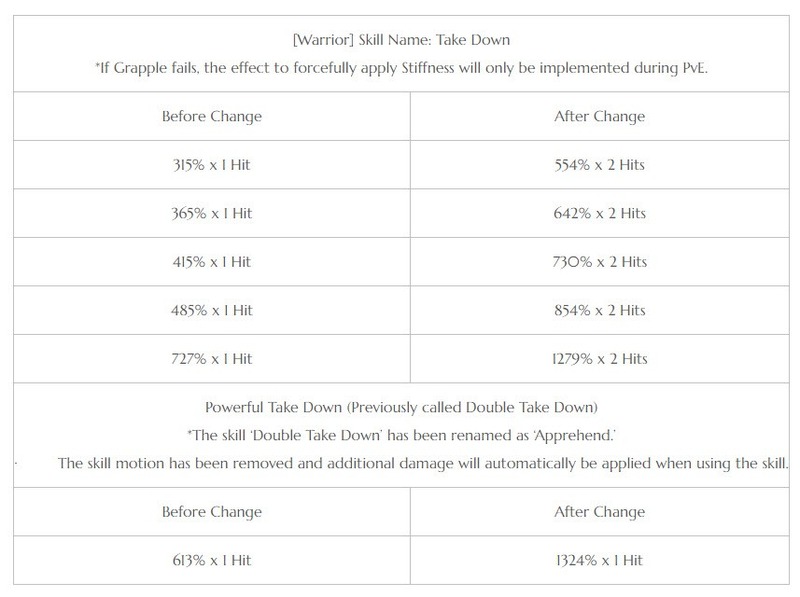 Most Grapple skills were originally designed to provide competitiveness in PvP (typically 1 vs. 1 combats), but as CC skill effect application has been adjusted, this advantage has been diminished. 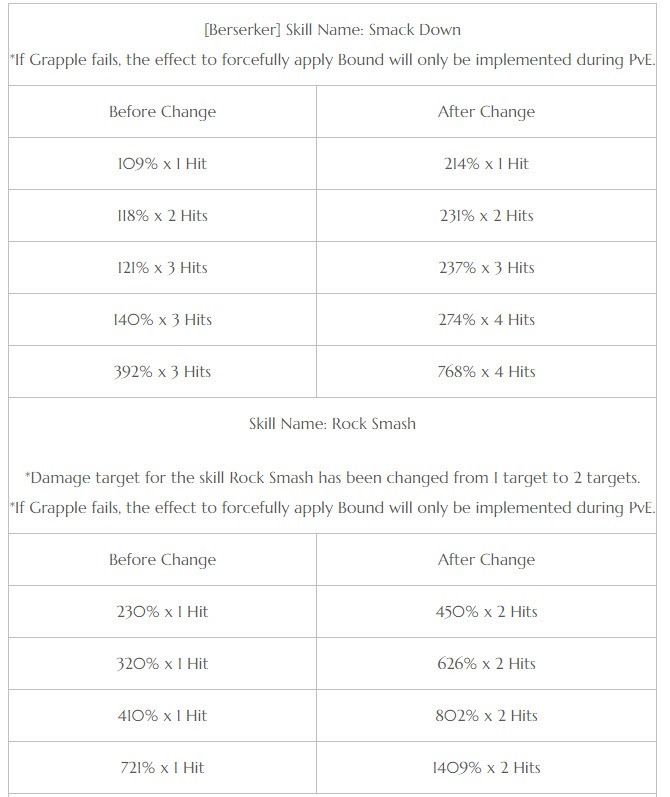 Thus damage has been increased greatly and it is possible for Grapple skills to be used in combos as effective skills themselves. Fixed the issue that created a birth mark for Warrior, Ninja, and Witch in Beauty (F4) when their lip make-up area was at maximum. Fixed the issue where Charging Slash was activated upon using LMB to move forward during Guard stance if you have only learned up to Charging Slash I. Using LMB while moving forward during Guard stance after having learned Charging Slash I, Charging Slash II, or Absolute: Charging Slash will activate Charging Slash. As the skill Double Take Down’s motion has been changed to be taking down a target on ground only once, the skill name has changed to reflect this. Guard will now be able to be applied even when back-stepping in Awakening Weapon mode. Fixed the issue where Stamina was consumed twice upon using the skill Vine Knot. Fixed the issue where you could not use Ultimate: Evasive Shot mid-air after using Evasive Explosion Shot. Fixed the issue where using Midnight Stinger while having learned Guilty Conscience and/or Eruption of Guilt would recover HP of the inflicted target. Fixed the issue where the Le Vladian Underwear would appear to be stretched out or graphically broken in attack mode. Fixed the issue where only 4 out of 7 targets were being inflicted hits for the Flow: Ancient Wave charging skill. Guard will now be able to be applied even when back-stepping in Main Weapon and Awakening Weapon mode. 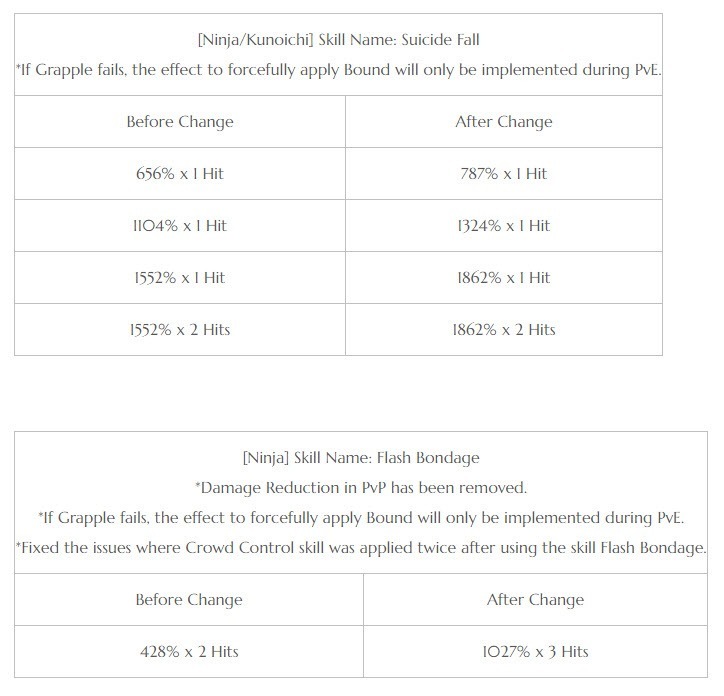 PvP damage of the skill Flow: Slugfest has been decreased by 13.9%. Fixed the issue where “Down Attack” was missing from the description of the skill Flow: Ancient Wave. Fixed the issue where “Down Attack” was missing from the description of the skill Flow: General Disarray. Connecting with other skills has become smoother after using Elastic Force while moving left and right. Fixed the issue where you could not use Headbutt and Beastly Wind Slash right after Ultimate: Storming Beast. Damage inflicted from the skill Smack Down will now match the description of the skill. The hit effect on the target of the skill Smack Down IV will now be displayed properly. Dash attack damage of the skill Absolute: Rock Smash has been increased. Fixed the graphical glitch of Puff Mini Shoes triggered when it was equipped with Enslar Armor. Fixed the issue where Witch’s Tritch Shoes could not be dyed when equipped with Deneve Outfit. Fixed the issue where the sound effect was heard by the opponent (target) upon using Ghost Step during Concealment state caused by Ninjutsu: Oni Shadow. Fixed the issue where the Sura Katana combat stance was kept upon manually collecting items after using the skill Illusion of Restraint. An icon for an Imperial Auction item, [Guild] Muraka Summon Scroll, has been added. A new item to get world boss weapons, Offin Tett’s Light Sealed Weapon Box, has been added. Open the weapon box to obtain an Offin Tett’s Radiant weapon exclusive to your class. Mix n’ Match Promotion where Event Cart was offered for Outfit category has ended. Monsters will appear more naturally after killing birds for Hunting such as Seagull and Eagle. Fixed the issue where you could collect Silver twice upon defeating Giath from Goblin Chief Summon Scroll for the daily quest. Relocated the Wooden Beehives in Hexe Sanctuary which could not be damaged because they were too close to the ground. Fixed the distance between the Black Leopards in Kamasylvia so that they can have some space between each other. Fixed the attack range of Lapis Lazuli Tree Spirit that was smaller than it looked. The attack range of Kamasylvia Black Leopards has been adjusted. Quests where you can exchange Offin Tett’s Light Fragment x10 for a Offin Tett’s Light Sealed Weapon Box have been added. The relevant quests can be accepted from Dikzipo the Blacksmith of Grána when you visit him with at least Offin Tett’s Light Fragment x5 with a character of Lv.56 and higher. The prerequisites for the following quests will now be displayed correctly. Fixed the NPC script from the quest Ardan’s Broken Gemstone #2. Fixed the issue where the Marketplace and Processing windows would open up at the same time at Storage. It has been adjusted that closing Inventory would close Mount Inventory together in Storage. Guild Bonus settings window has been improved. The space between guild members has been expanded in the list, and a line has been added to separate each member. Renown score icon will be displayed under My Information (P) Window.